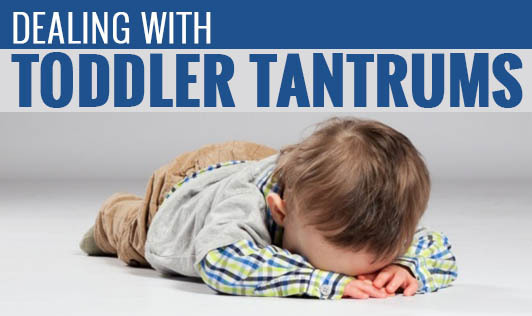 Toddler tantrums usually start at around 18 months and are very common at that age. One reason for this is that these toddlers want to express themselves but find it quite difficult to do so which comes out as a tantrum. Once the child is able to talk, they‘re less likely to have these tantrums. • Ignoring and staying calm: Toddlers usually like to be the centre of attention and a lot of their tantrums are to get your attention. If you make a big deal about bad behaviour, this itself can be a reward for an attention seeking toddler. So, ignore and remain calm. This will help your child understand that you are ignoring him or her because the behaviour is unacceptable. When your child calms down, talk to your child about his/her tantrum. • Try to determine the cause of tantrum: This can be triggered by a number of things. If it is triggered by hunger or sleepiness, feed your child or allow him to take a nap as soon as possible. If it is triggered by frustration, you need to comfort your child. • Say no and mean it: Rewarding uncontrollable tantrums can encourage your child to use deliberate tantrums to get what he or she wants. So, learn to say "No" to your child and stick to it. • Distract your child: Refocus his or her attention by calmly offering something else to do, see, eat or play with. • Don't take your child's tantrums seriously: Remind yourself that this tantrum is not about you, it's about your child being overwhelmed. Speak in a low voice, don't try to pick him or her up and reassure your child that he/she will be fine. • Don't get too angry as it will just make the situation worse. • Don't push tantrums as it won't solve anything. You need to identify what triggered the anger and deal with that. • Don't assume that cuddling your child post tantrum is overlooking the behaviour. Your child is besieged and needs comforting. • Don't bribe your child out of a tantrum.